To sing the song, and put the floor pan to bed. 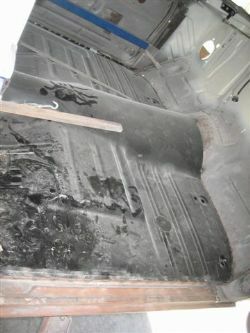 The floor pan now proudly sits between the new sills on Project Nomad. 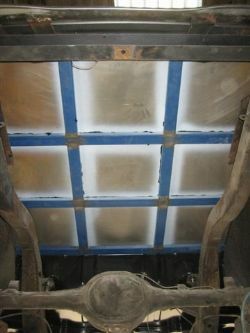 As mentioned earlier this was a one piece pan with no seams or welds and the inner sills and braces already attached. Along with a set of new outer sills the remaining bodywork can now start in earnest. It looks somewhat surreal; this shiny black piece of metal in a sea of gun metal grey primer but it certainly brings a smile to my face. It has been welded to the toe board and the new fabricated flat floor for the rear of the wagon and it makes a pleasant change from viewing the floor of the workshop when you peered in the window. I thought the floor pan was made in China but it came from Taiwan. Now we all know the Chinese would argue that Taiwan is China, but don’t try telling a Taiwanese resident that. 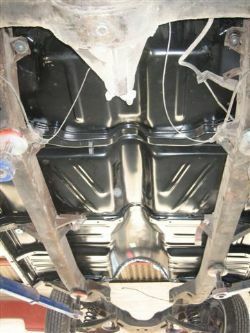 All that aside the good news is it fits well and the guys at Joscar who have welded in a few tri five Chev floors in their time were suitably impressed by the fit and finish. Now you may be excused for thinking I’ve been a bit over the top on all the words written around the floor pan and you would probably be right. This has been a saga for far too long and I feel that we have reached the crest of the mountain and can now coast down the other side. Until we hit a reality check, of course. I have all the bits to put Project Nomad back together and apart from chroming a lot of parts and sending the alloy trim to Moulding Repairs and Polishing to be straightened and polished most of what is left now is time and labour building the car. I have no doubt there will be other dramas pop up, stuff that I forgot to order or didn’t realise I needed to order but I doubt if anything will come close to the floor saga. Next up is to build it, then pull it apart again so we can send the chassis and body back to the paint shop to be separated from one another. 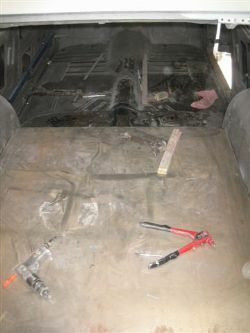 With the body off it will allow me to prep and paint the frame prior to painting the entire car.